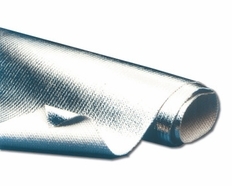 Thermotec Aluminized Heat Barrier is designed to either protect components from heat, or hold heat inside a component. Capable of withstanding radiant heat temperatures of over 2000 degrees f and direct (touching) temperatures of over 750 degrees f. It is made of woven silican with a flexible aluminized finish. For conductive applications, the fabric side can handle temperatures of up to 1200 degrees f. The uses are endless for this item. The part number for this item is 14001-50 and it is a 50 Foot Long by 40" Wide piece that can be easily cut with a razor knife.